Hose Drainage There is a knockout port on the side of the dehumidifier. I talked to some guys at work and they said I'd be able to hook-up a hose to have continuous drainage into my subpump instead of constantly emptying the drainage pan. Am I able to do this with the Windchaser? Yes, that is what the knockout port was designed for. Make sure the hose you get does actually thread onto the hose connection port before you punch out knock out. The hose should be a standard garden hose connector. Because your model dehumidifier has an unusual continuous drain hook up, as compared to other brands, I have included a link to the Owner's Manual for your model. You will find the information on page 3. You can downlaod and print the, manual for future reference. One thing the Owner's Manual fails to mention is the length of the garden hose that can be attached to the unit. It should not exceed 5 feet. As drainage relies entirely on gravity to drain. I hope this has helped you. Please let e know. Thanks. 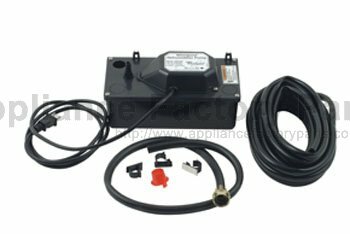 Dehumidifier pump assembly conveniently attaches the pump kit to you dehumidifier. connect a run hose to a nearby sink, pump, or floor drain. this pump will push water through a hose to up to 18 vertical feet for drainage through a window. If you can gravity feed it and can get a hose around the output pipe then any flexible hose will work that is slightly larger than the output pipe. This may not help because I'm not sure of what you have, but most dehumids when using a hose hook to a fitting on the tank. If that's what you have, before you hook the hose you have to either punch a knockout in the center of the hookup on the tank or cut it out. Hope this helps. I have a similar Whirlpool dehumidifier and a similar problem. Have you tried setting it to continuous mode? My understanding was that it would only divert the drainage to a side hose when in the continuous mode. Take out the drain pan and look in left hand top of the compartment and you will see a drain hole for the pan.Plug the drain hole with a small rubber plug, I used an electrical wire nut wrapped with tape and it worked fine.replace the pan and the water will run out the back. A 3/4" garden hose should work for the drain hole. I have the same problem and after talking (mostly waiting) with Fedders repair, I have been told how to solve the problem. Plug up the drain hole on the right side (the one not connected to the drain hose). The drain hole extends down about 5mm, outside measures 10mm and interior measures 7mm. They do come with a drain hold cover. Not a replaceable part with a number. Off to the hardware store. check to see that the hose isn't clogged, and that the hose runs down hill from the tank all the way to the drain. if it is higher than the tank at any point in its path it will not drain. you may put the dehumidifier on top of a small platform to aid drainage. also check that the knockout removed so there is a hole to let the water go from the tank to the hose? windchaser dehumidifier doesn't shut off even when turning dial in all directions what should I do? my dehumidifier blows very hot air while working. Makes it hotter than it was before starting. Like a furnace. My dehumidier pulls out water from the air like it should but blows very hot air while working. Like a furnace. How do I fix this? Do I raise the top vent lid or leave it closed when running the dehumidifier? My dehumidier blows very hot air while working. Makes it hotter than it was before starting. Like a furnace. Have a manual for Windchaser WDH928 Dehumidifier?